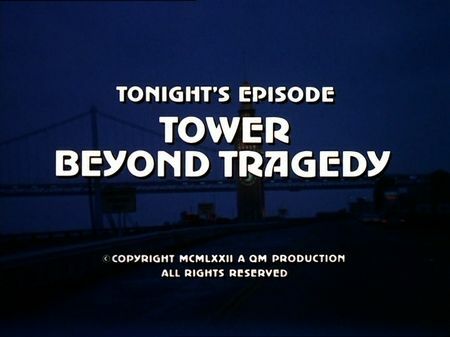 I've just posted screencaps for Tower beyond Tragedy in the episodes section, one of my favourites of the first season actually. Edward Mulhare performs excellently here as the ageing aristocrat Amory Gilliam who cannot cope with old age, trying to find relief in dating young, attractive women and turning their appearance into his wife when they were younger. By the way, young Stefanie Powers is definitely on a par, performing a multi-rôle of Gilliam's latest victims. Furthermore, this is one of those psychothriller-like plots illustrating the wide spectrum of the series, and it also features that insistent piano sequence used several times throughout the series when a character's tragedy plays a major rôle. The dramatic climax of this episode takes us down the Pacific shore where Mike and Steve arrive on the scene and crush down a finally cracking down Gilliam just before he could hustle Kim Ahern down the rocks. It actually was the first episode for me to capture on screen, so please apologise the number of 120 pictures.